“Squats are bad for the knees” is the biggest myth in weight training. You may have heard that full squats are bad for your back, too. The correctly performed squat is a hips-dependent exercise. It doesn’t really stress the knees much at all. And the correct position at the bottom of the squat does in fact load the back. Which is fine, because the squat is a back exercise too. Look at the picture above. This is the correct bottom position of a squat. The hips are just below the level of the top of the knees, the shins are not quite vertical, and the feet and the thighs are aligned so that there is no twisting in the knees and ankles. The back is at an angle that supports the load, and the hips are positioned to do most of the moving of the load. In this position, the knees are barely involved. Both the knees and the hips have to bend in order to lower and raise the bar, but in the correctly performed squat the majority of the load is on the hips and back. If this position is unsafe, toilets are in trouble. When the hips are shoved back into a position that takes the load from the knees, another very important thing happens: The hamstrings are tightened. 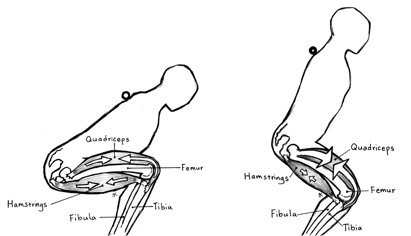 As shown below, the hamstrings connect the back of the tibia to the hip, and therefore exert a backward tug on the knee. This quite effectively counters the forward pull on the knee from the quadriceps. But this protective effect takes place only if the hamstrings are tightened by sliding the hips back into the full squat position — it doesn’t occur if the knees stop above parallel, at 90 degrees. If the back stays too vertical, the hips aren’t loaded, the knees are. The hip joint is a robust stable structure that is capable of handling heavy loads without injury. The muscles around the hips are the biggest muscles in the body, and they have the greatest potential to get stronger — if we load them correctly by making them work against the leverage that is generated by the position in the photos above. To load the hips, we must have a more horizontal back angle. In the squat, the back functions as a solid segment, a force transmitter between the hips and legs and the barbell on the back. It is held as a rigid stable segment by all the muscles of the trunk — the spinal erectors, the abdominal muscles, and all the muscle mass that surrounds and supports the spine. Therefore, the squat is a back exercise too, and as the back muscles do their job of keeping the back rigid as the weight gradually increases over time, the squat gradually strengthens the back just as it gradually strengthens the hips and legs.